Some shingles blew off in last storm. can see daylight thru the cracks in the attic. I'm looking for an estimate on gutter replacement - possibly with a leaf guard. Thanks! Replacement vinyl siding and gutters, downspouts. Hello, We previously had you replace our roof in August 2016. Daniel McDonald was our rep.. We would like to get a price estimate/quote for replacing our siding. Hi i would like to get a quote for siding and gutter replacement. You can contact me anytime via email or stop by anytime to assess and drop off your estimate. Thank you and i hope to hear from you soon. Summit Roofing and Siding Contractors is your regional roofing contractor in the Lansdale, PA area, offering high-quality roof repair and roof replacement services. 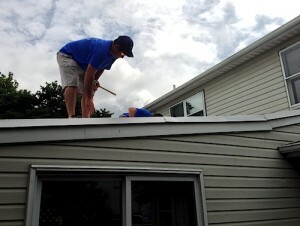 Ever since our beginning in 2009, we have been providing the best roofing, siding, and gutter work for our customers. Our familiarity with Pennsylvania means that we know the best solutions to keep your home safe and dry through snowy winters, rainstorms, heavy winds, and anything else the weather might bring. As an Owens Corning Preferred Contractor and an Angie's List Super Service Award winner, you can rest assured that your home or commercial property will be in safe hands with us. Don't hesitate to contact us today to schedule your professional roof inspection and free cost estimate! Are you looking for an affordable way to boost your curb appeal and property value? New siding installation might be the solution, providing an easy and low-maintenance home remodeling option that will help you save money in the long-run by increasing your home's energy efficiency. Here at Summit Roofing and Siding Contractors, we provide aluminum siding, cedar siding, fiber cement siding, vinyl siding, and more. Our siding replacements are available for both residential and commercial siding projects throughout the Lansdale, PA area. Summit Roofing and Siding Contractors is the roofing and siding company that you can rely on for roof repair, replacement roofs, siding installation, gutter guards, and more. Contact us today for a free, no-obligation estimate and get started on your home improvement project in Lansdale, PA or an area nearby! What Happens During A Roofing Estimate? Hello,we are interested in an estimate to replace our existing original roof and either replacing or repairing the gutters.